Can you imagine being able to see the alarm clock or play sports without the hassles of glasses or contact lenses? Laser vision correction options at Mississippi Vision can help set you on a path for reduced dependence on glasses or contacts. In most cases, our patients do not need glasses or contact lenses after laser vision correction. We are proud to offer laser vision correction options as well as other vision correction options. For laser vision correction, we offer two main types of eye surgery, LASIK and PRK (Photorefractive Keratectomy). 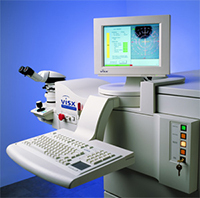 Both of these forms of laser vision correction work very well and have similar outcome results. Depending on your unique visual conditions, our ophthalmologists will make a recommendation about what procedure would be best for you. Mississippi Vision can provide you with an informational package to help you better understand if LASIK or PRK is right for you. Please contact us to request more information or to schedule a screening appointment. Before we get into a detailed discussion regarding these 2 types of laser vision correction we wanted to explain the basic differences. Remember both types yield excellent results but the surgical techniques do vary. LASIK eye surgery is the most popular of the 2 procedures and the healing time is typically faster than that of PRK. With LASIK eye surgery, a hinged flap is created in the middle layer of the cornea. The flap is folded back to expose the corneal layers underneath. An excimer laser is then used to treat the middle layer and the flap is repositioned for healing. In PRK, no flap is created. Instead, the outer surface of your cornea – referred to as “epithelium” – is removed and discarded. Once this is discarded the excimer laser is then used to reshape the cornea. In order to determine the best procedure for you please consult with the skilled Mississippi eye doctors at Mississippi Vision Correction Center. With the development of precise surgical cutting instruments, an excimer laser is combined with an incision to produce a particular surgical result. This LASIK procedure has become, by far, the most commonly performed refractive surgery procedure used today. During LASIK, the surgeon first creates a thin corneal flap using a device called a microkeratome. The corneal flap is lifted up, and the laser beam is applied to the exposed interior surface of the cornea to reshape the tissue. The flap is then replaced over the treated area. This corneal flap serves a natural bandage, which eliminates the discomfort associated with other types of refractive surgery and expedites the healing process. Because of the extraordinary bonding properties of the corneal tissue, stitches are not needed to keep the flap in place postoperatively. A complete eye examination and consultation with your eye care professional will help determine the answer to this question. Your body and your eyes must be healthy, and your vision prescription must be stable. Your visit on the day of the procedure will usually last about one and a half hours; you will be in the laser room for about fifteen minutes. The rest of your stay will consist of signing a consent for treatment and other paperwork, preparing for the procedure, and post-procedure instructions. During the procedure, you will feel a slight pressure while the flap is being created. This will last for about five to ten seconds. During the rest of the procedure, you should feel nothing. After the procedure, you may feel some discomfort for the first few hours. Many of our patients tell us that the sensation is similar to having hair in their eyes. We recommend that, following the procedure, you go home and rest with your eyes closed. Ideally, you should try to get some sleep. Will both of my eyes feel the same? It is common for one eye or the other to be more uncomfortable during the initial healing process. This should stabilize by the day after your procedure. Will I see clearly right away? Immediately after your procedure, your vision may be a bit blurry, almost as though you are looking through a glass of water. This is to be expected. Over the next two weeks, you should regain 80% or more of your distance vision. One eye may recover clear vision more rapidly than the other. This too will even out as the recovery time progresses. Most people return to work the day after having the LASIK procedure. Can I resume playing sports after LASIK? You can resume most normal activities the day after your surgery. You should, however, avoid contact sports and swimming for two weeks after the surgery. No, there will be no bruising from the procedure. You may, however, experience some “redness” in and around your eyes. This should clear up within several days. Will it take more than one procedure to correct my vision? Under or over response to the procedure is possible and is seen most often in patients with fairly high prescriptions. An enhancement procedure can be performed to remedy this and achieve the desired result. I wear bifocals now, will I still need them after the procedure? Your distance vision will be corrected with the LASIK procedure. Presbyopia is part of the aging process we all experience. It develops as the lens of the eye loses some of its flexibility. This typically occurs between ages 40-50. Mild myopia counteracts presbyopia. That is why if you are slightly nearsighted, you can remove your glasses and still be able to read, even after presbyopia sets in. After having Laser Vision Correction, your myopia may be gone, but you may need reading glasses to see fine print like other presbyopic people with normal vision. What about sensitivity to light? You may find that during the healing process, you are a bit light sensitive. In addition, halos and glare during night driving may be more noticeable. These conditions should decrease with time. Do I need to keep my contacts out? What about make-up? Yes, you need to remove your soft contacts for two weeks prior to the evaluation to determine if you are a candidate. If you wear rigid contacts, remove them for three weeks prior to your evaluation. Contacts should be removed again 3 days prior to the surgery. Do not wear eye make-up for three days prior to or three days after the surgery. Included in the price is the pre-procedure testing and consultation, initial drops and medications, and the LASIK procedure. The length of follow-up and needed enhancements are included with some packages. The fee for the surgery center needs to be paid the day of surgery. Financing is available for those who are unable to pay in full for the surgery.